The Dow rose as much as 293.47 points, but a late-session sell-off in bank shares knocked the 30-stock index from its highs. Bank shares traded higher for most of the day after announcing buybacks and dividend hikes following the Federal Reserve's annual stress test. "For the stock market, the rest of the year could be quite exciting, in both a positive and a negative sense," said Brad McMillan, chief investment officer at Commonwealth Financial Network. 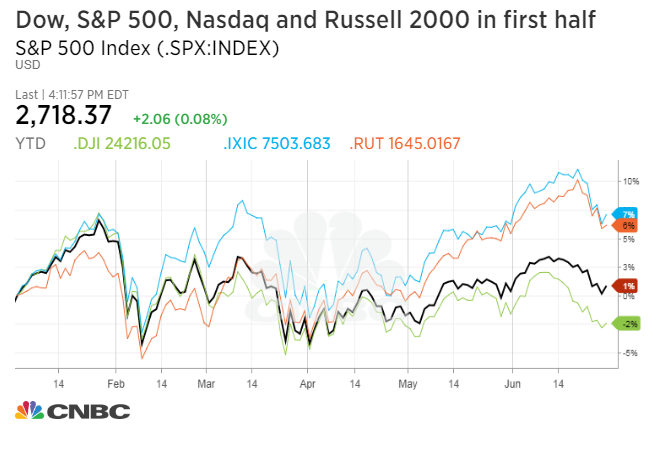 "I expect the U.S. equity markets to end the year with moderate appreciation from levels at the end of December—around 3,000 for the S&P 500 as a base case." "In the nearer term, the Trump administration’s trade policies have the potential both to disrupt supply chains and increase costs, which would certainly affect financial markets," said McMillan.